This is our third food price index. We shop around a little bit but in general the stores we buy at have the best prices, discounts, promotions and quality. In order to offer the most unbiased inflation index the prices of the respective food categories were taken from the same stores. We have also included a few items from the government “basket”. These items prices are set by the government. We would also add that we do all dairy and deli shopping at Carrefour on Mondays and Tuesdays where we earn a 30% credit. We buy our cooking oil, white flour, yeast and mate at Carrefour with our coupons every month. 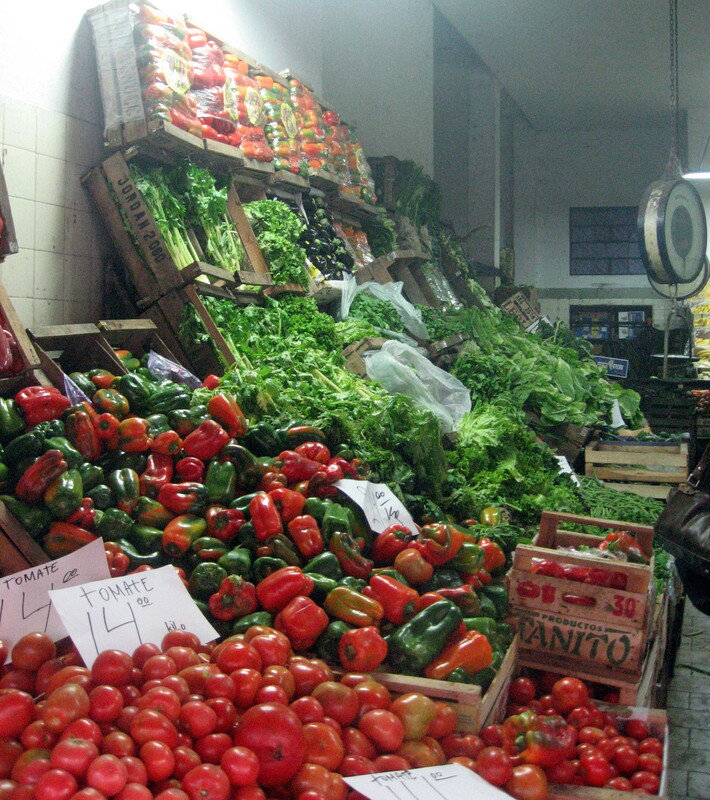 Fruit and vegetable prices were taken from “Frutería y Verdulería Ayacucho“. Bulk, “health” food products prices were taken from “Dietética Tomy“. Meat prices were taken from “Frigorífico El Santiagueño“. Dairy and deli prices are a sample of the prices that Carrefour offers. Eggs were purchased at Coto. Este es nuestro tercer índice de precios en alimentos. Comparamos precios y elegimos las tiendas, asi finalmente compramos dónde encontramos: mejores precios, descuentos, promociones y calidad. This entry was posted in aliment, groceries and tagged aliment, alimentos, Argentina, Bell Pepper, Buenos Aires, C.A.B.A, Capital Federal, carne, Carrefour, cheese, dairy, Dietética Tomy, Food, Frigorífico El Santiagueño, fruit, frutas, inflación, inflation, inflation gauge, lácteos, meat, price index, queso, South America, vegetables, verduras on September 2, 2014 by ayresinsider. This is our second simple food price index. In order to offer the most unbiased inflation index the prices of the respective food categories were taken from the same stores. 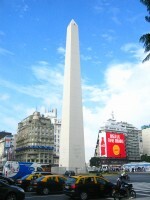 The stores that we took price samples from were the stores with the best prices that we have found in Buenos Aires. Bulk, “health” food products prices were taken from “Diética Tomy“. Este es nuestro segundo índice de precios de comidas. Para poder ofrecer un imparcial indice inflacionario de los diferentes alimentos, éstos precios fueron obtenidos en cada mercado. Los negocios donde tomamos los precios fueron aquellos dónde encontramos las mejores ofertas. This entry was posted in aliment, groceries and tagged aliment, alimentos, Argentina, Bell Pepper, Buenos Aires, C.A.B.A, Capital Federal, carne, Carrefour, cheese, dairy, Dietética Tomy, Food, fruit, frutas, inflación, inflation, inflation gauge, lácteos, meat, price index, queso, South America, vegetables, verduras on August 1, 2014 by ayresinsider. 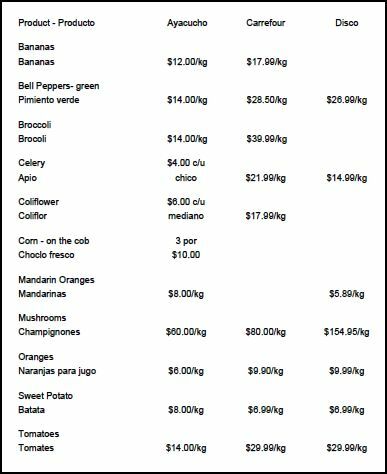 This is our first very simple food price index. In order to offer the most unbiased inflation index the prices of the respective food categories were taken from the same stores. The stores that we took price samples from were the stores with the best prices that we have found in Buenos Aires. Dairy prices are a sample of the prices that Carrefour offers. Este es nuestro primer y sencillo índice de precios de comidas. Para poder ofrecer un imparcial indice inflacionario de los diferentes alimentos, éstos precios fueron obtenidos en cada mercado. Los negocios donde tomamos los precios fueron aquellos dónde encontramos las mejores ofertas. 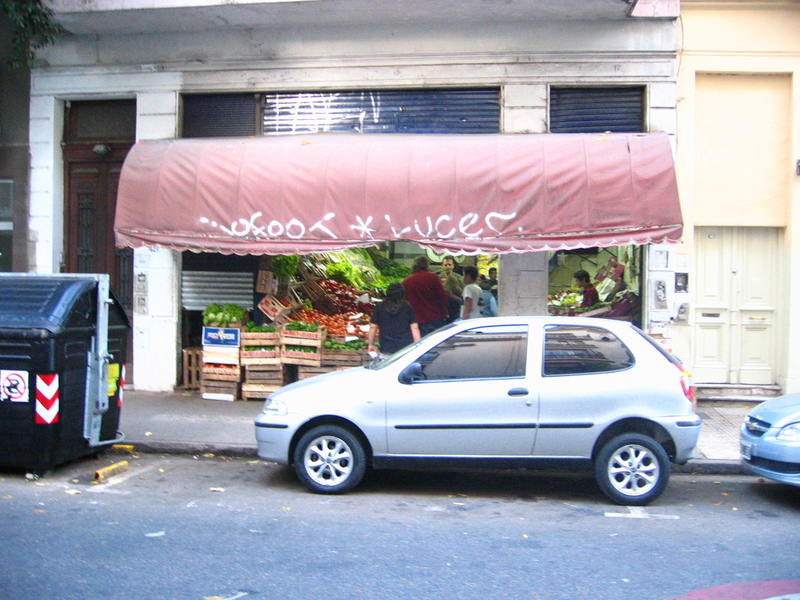 This entry was posted in aliment and tagged aliment, alimentos, Argentina, Buenos Aires, C.A.B.A, Capital Federal, carne, Carrefour, cheese, dairy, Food, fruit, frutas, inflación, inflation, inflation gauge, lácteos, meat, price index, queso, South America, vegetables, verduras on July 2, 2014 by ayresinsider. Fruteria Y Verduleria Ayacucho sells fruit and vegetables for good prices. They sell a lot so the produce is usually pretty fresh. The guys there are friendly and the service is quick. It is usually pretty busy. One product you will not find there is ginger; the owner, an older Italian, thinks that it brings bad luck. Fruteria Y Verduleria Ayacucho vende sus productos a muy buen precio. Venden mucho por lo tanto todo es muy frescos. Los muchachos son amigables y el servico es rapido. Estan, generalmente, muy ocupados. No tienen jengibre porque el patron, un italiano major piensa que el jengibre le da mala suerte. This entry was posted in aliment, specialty stores, Uncategorized and tagged Argentina, Balvanera, Buenos Aires, C.A.B.A, Capital Federal, fruit, frutas, Industria Argentina, Made In Argentina, regional products, vegetables, verduras on May 28, 2014 by ayresinsider.